Gross capacity: 1300 l; Outer Ø: 1360 mm; Power - BONFIGLIOLI С413 U FA. Gross capacity: 1600 l; Outer Ø: 1360 mm; Power - BONFIGLIOLI C353 U FA. 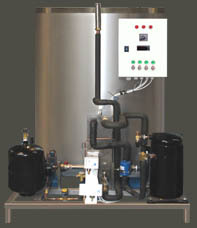 Gross capacity: 1000 l; Outer Ø: 1360 mm. 1 pc. – Blonderbeer СV-01 – equipment for collection and storage of yeast. For transportation of the brewery BlonderBeer. Type D(N) 1000 l needed are needed 2 (two) heavy tilt trailers (height: not less than 2.95 m height and not less than 13.6 m long). Company TECHIMPEX can arrange the transportation of the brewery to the customer’s company for additional payment. If you specify the city of the transportation we will be able to inform you the price of the transportation. Three persons (2 technologists-brewers and 1 maintenance worker) are needed for servicing the brewery Type D(N) 1000 l.
Installation, regulation and launching by trained work team of the company TECHIMPEX included in the equipment kit price. OPTION 1. After the brewery launching at a client’s company, TECHIMPEX sends a brewer for 21 days thorough training of your staff (included in the cost).